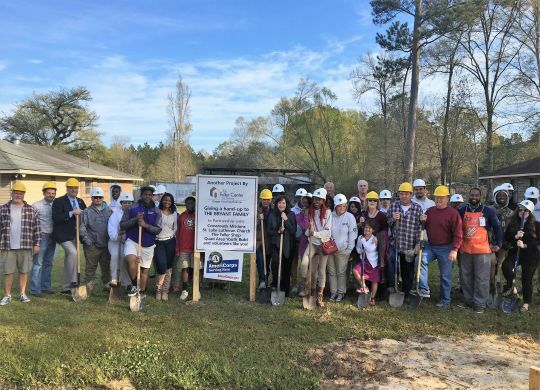 Many Fuller Center for Housing new home builds have gotten a huge head start thanks to CrossRoads Missions and enthusiastic volunteers from churches across the nation. CrossRoads sends lumber packages to churches, who often put dozens of volunteers to work on their grounds assembling walls that will be stood up and placed in the shape of a house. The entire process usually takes a day or two and makes for a tangible way for church members to put faith into action over a weekend. Volunteers often inscribe CrossRoads walls with inspirational messages and Bible verses. The walls are then trucked to Fuller Center covenant partner sites to be raised at new home builds. It not only reduces the cost of a new home build — thus lowering the homeowner partner’s zero-percent-interest, no-profit-made mortgage payments — but it also speeds up the process of building new homes. Unfortunately, these church members rarely see the walls reassembled on the first day of the actual build. However, a team from St. Luke Lutheran Church of Cabot, Pennsylvania, did get to see the resurrection of their CrossRoads Missions project today at the groundbreaking for a new home in Hammond, Louisiana — more than 900 miles away and nearly six months later. They just happened to be on a mission trip only 40 miles away and were able to attend the Ginger Ford Northshore Fuller Center for Housing’s groundbreaking today for a home that will be owned by Chanta Bryant, who has two sons, one a senior in high school who will begin studying pre-med at Millsaps College in the fall and the other a fifth-grader. Quad Area Youth Build students and staff will complete the construction of the house.